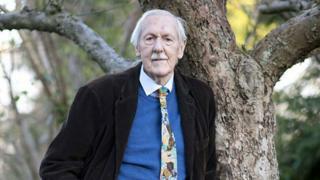 British science-fiction author Brian Aldiss has died at his home in Oxford, having only just turned 92. His death was announced by his literary agents Curtis Brown, who called him an "author of science fiction classics" as well as "an entertaining memoirist". Aldiss's short story Supertoys Last All Summer Long was the basis for the 2001 film AI Artificial Intelligence. Developed by Stanley Kubrick, the tale of a boy-like robot was eventually directed by Steven Spielberg. Blur member Graham Coxon and fantasy writer Neil Gaiman are among those to have paid tribute on social media. Aldiss's other works included Greybeard, Hothouse and the Helliconia Trilogy, a trio of novels set on a planet where seasons last for centuries. Made an OBE in 2005 for his services to literature, he was a drinking companion of Kingsley Amis and a founding member of London's famous Groucho Club. Alongside JG Ballard, Aldiss pioneered a new wave of science-fiction writing in the 1960s that took the genre into uncharted territory. "I don't agree with those people who think science fiction as some kind of prediction of the future," he said on Desert Island Discs in 2007. "I think it's a metaphor for the human condition." Born in Norfolk in 1925, Aldiss was greatly influenced by HG Wells and corresponded with both CS Lewis and JRR Tolkien. According to his publisher, the author - who turned 92 on Friday - died in the early hours of Saturday morning.